Sava River Bridge, originally uploaded by bill kralovec. 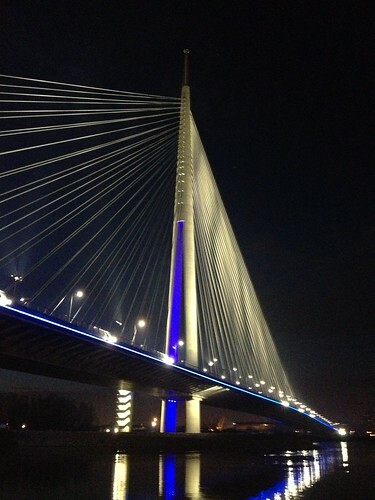 Last night I was running along the Sava and snapped this photo of the stunning bridge at night. The construction continues with the various on and off ramps and they even have a set of stairs for walkers wanting to cross from the river’s edge. It was a lot of money, but it has made Belgrader’s crossing of the Sava easier and it does provide another “icon” of the city of Belgrade. Great picture – the blue is intense. Tough work running in this weather.